1. What’s behind the concept of Students Self-Administration? Students Self-Administration is the concept of uniting any student of the Ruhr University in one legal entity much like an own tiny society. Any student becomes a member of that society automatically with the second of his immatriculation (no exception for guest students of foreign contries). As a part of that society any student gains the right to participate in the many and diverse forms of its organization. The Studentbody of the Ruhr University is – legally speaking – a part of a public corporation (the Ruhr University itself) and is therefore legally able to enter into its own contracts, which can also be effective towards the individual students (for example the metropolrad.ruhr contract or the Schauspielhaus Bochum flatrate). Those contracts are binding until the second of you exmatriculation. The student body also sets its own rules for its organization (though there are some laws from the land of Northrine-Westfalia we have to follow) and its own code of conduct. 2. What does the student body’s organization looks like? a) All of the students inside the student body are represented by the student parliament, much like the entire population of the Federal Republic of Germany is represented by our Bundestag. The student parliament however is elected once a year. The members of the student parliament are elected in general, direct, free, equal and secret elections. The parliament has 35 members. Members can organize themselves in so called lists and can profit from those lists in their elections but aren’t bound by them in any other situation than the election itself – there are some modification towards the rights of lists, however. By northrhine-westfalian law the student parliament is the highest committee of the student body. Only the parliament can legally bind the whole body into contracts. The parliament elects the students' union executive committee. The executive committee administrates the finances of the student body, and contributes to the cultural, social and political education of the students within. b) On a lower level there are semi-bodies of the overall student body which are called Fachschaften which is the student body of one or more departments. Those semi-bodies can organize themselves to the extent that the overall student body allows them to. They elect their own board of representation – called Fachschaftsräte. Each of the Fachschaftsräte delegates one member to represent his or her Fachschaftsrat in the Fachschaftsvertrerinnenkonferenz, the so called FSVK (Board of Representatives of the Fachschaftsräte). 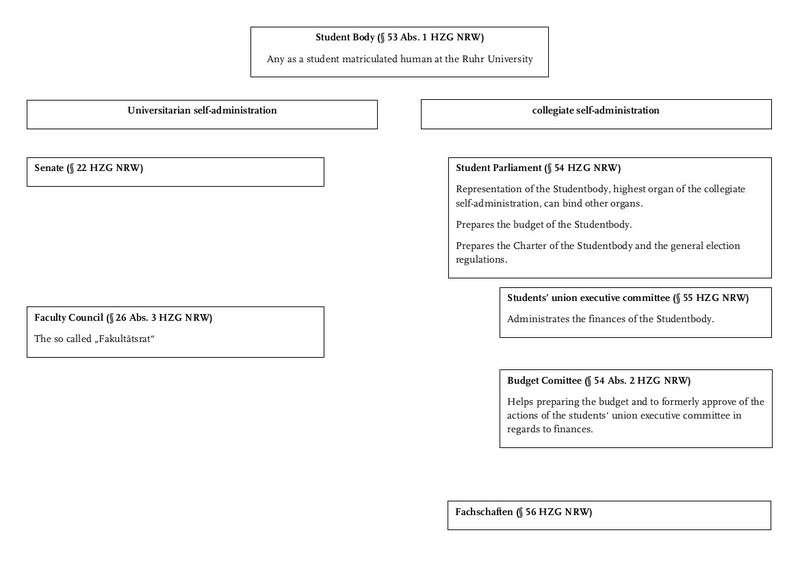 The FSVK acts as a mediator towards the Fachschaftsräte inbetween them and represents them towards the students’ union executive committee and the student parliament. 3. How do I become a member of the student parliament? The members of the student parliament are elected annually. Every student can enter into the elections with his or her own list on policy on higher education. The list is considered founded after the registration with the election supervisor. The list can include as little as one student and is not capped at any level. To finalize the registration the list needs a certain amount of supporters who don’t have to be members of the list, or are in any way obliged to vote for the list afterwards. After the registration is finalized the list cannot be altered anymore. 4. What does a member of the Student Parliament do? Every member has rights and obligations during the sessions of the parliament and in-between. A member can demand a certain topic to be discussed, he can address the members of the students’ union executive committee and the speaker of the parliament with questions, and he is able to vote for or against the discussed topics. Although the members got into the parliament through the help of the political lists, these lists have no influence onto the members in a legal way. The status as a member of the parliament therefor does not depend on the membership of the list. 5. What’s the relation between the student parliament and the student’s union executive committee? 6. What’s the relation between the parliament the Fachschaftsräte? 7. Who can I talk to about questions and suggestions? With exemptions any student can directly address the parliament through the speaker with a suggestion to discuss a certain topic. Through the years the student body has developed a – almost inscrutable – number of contact persons on the levels below the parliament. Talk contact the students’ union executive committee or the speaker of the parliament for further information.